Friday, June 6th | Media Day: A group of Press/Journalists enter the house to compete in a mini mock set up of the game the later they write/talk about their experience in the house. We know BB12/BB13's Rachel Reilly was one of the people to enter the house, along with folks from Xfinity, CBS, People Magazine, and more! Friday, June 13th* | Kidnapping: Big Brother Production will film the hometown segment that airs before the houseguests enter the house then they will take them to a Hotel in California were they will be in sequester until a few days before the premiere. Tuesday, June 17th | Press Day: Thanks to our good friends over at BigBrotherNetwork.com, we know that "Press Day" will be the 17th. Press day is the day where press from CBS, ET, Big Brother Blogs, etc.. get to interview and get to know the BB16 cast! Saturday, June 21st* | Houseguest Enter House: The BB16 houseguest will enter the house and the game will begin. Sunday, June 22nd* | Cast Revealed: According to our friends at Big Brother Network, who are participating in Press Day, the cast will be revealed on the 19th. However, based on past seasons we think it won't be until the 22nd. 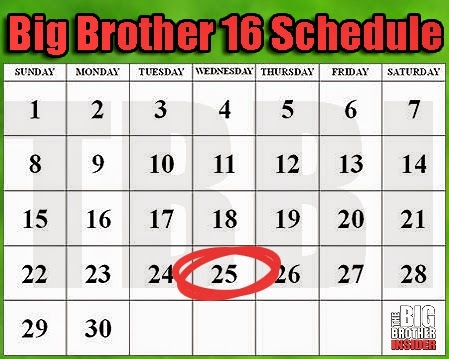 Anyways, this is the day CBS will announce the cast for BB16 and The videos from Press Day will be posted/aired. Monday, June 23rd | Media Day Content: We've been told the folks that participated in Media Day have to wait until June 23rd to say or do anything (publish articles) until the 23rd. However, we suspect it could be earlier. Wednesday, June 25th | "The Talk" Enters The House: We haven't heard anything about this from the ladies at the "The Talk" but we suspect that they will enter the house and play the game again this season to promote the premiere (Pre-Taped). Wednesday, June 25th | "Big Brother" Premieres: BB16 Premieres at 8pm on CBS!!! Thursday, June 26th | After Dark: After Dark will air on TVGN (TV Guide Network) it will air for two hours, starting at 12/11c. Thursday, July 3rd | First Live Eviction: CBS said the first live eviction will happen on the 3rd at 9pm. *Date estimated based on past seasons. Get ready for season 16 by LIKING us on Facebook or give us a FOLLOW on Twitter! They are not gonna release the cast on Father's Day. It will be on the Thursday/Friday before the premiere like it is every season.